The time has finally come! We are very excited to announce our debut album “Developing” is done! We will be holding our CD release party on Saturday, March 14th from 7:00 to 9:00 p.m. at Park Street Pizza in Sugarcreek. The event will double as the grand opening celebration of Park Street’s new dining room, so come hungry and check out their AWESOME expansion! Mark your calendars now, and stay tuned for more exciting details! *We will be joined by several special musical guests throughout the evening! *Park Street Pizza will be selling a limited-time only Kodachrome pizza! 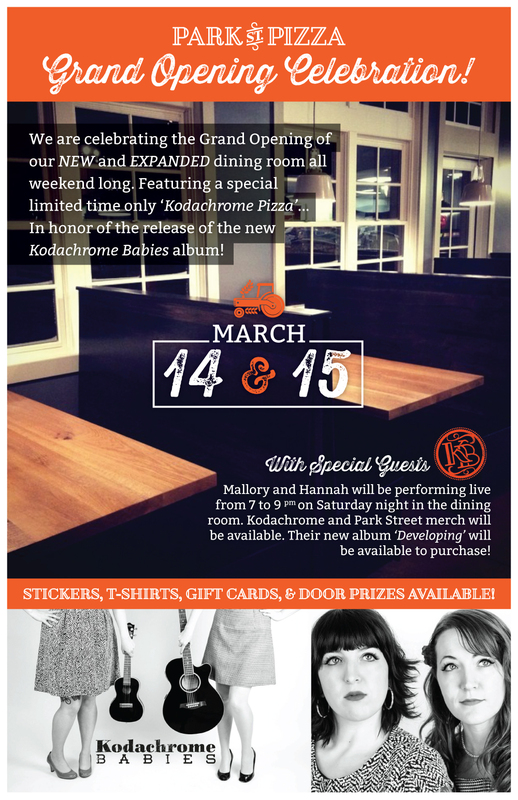 *We will be giving away a prize that includes Kodachrome Babies and Park Street swag!